The pages referenced below form a network of Datasets, preservation and curation Issues with those Datasets, and Solutions to those Issues. As such, these pages capture information and requirements about concrete digital preservation and curation challenges, that are present in specific datasets and collections. The experiences of solving these Issues are written up on Solution pages. These in turn link to pages in the OPF Tool Registry, and to actual code that can be downloaded and re-used. The purpose of these pages is to share experiences in solving preservation and curation problems, so we can learn from each other, and to articulate practitioners needs and requirements to those who are in a position to produce practical solutions to their problems. The work collated on this page is supported by: Open Preservation Foundation , Jisc , European Commission , Digital Preservation Coalition , SPRUCE Project , AQuA Project , SCAPE Project , and you! 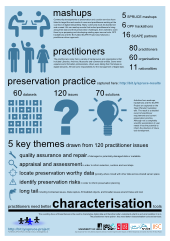 Analysis of the Datasets, Issues and Solutions collated on this page indicated a broad cross section of preservation requirements, but an overriding need for more effective characterisation. Practitioners need to understand more about their data and it's condition, typically for quality assurance, appraisal and assessment and for identifying preservation risks. This analysis and details of these conclusions are described in this poster, published at the 8th International Digital Curation Conference, Amsterdam, January 2013. Anyone can contribute to these pages. All you need to do is register for an OPF account (its quick, free, and anyone can do it), and then start adding comments, adding value to existing pages, or contributing new ones. Please help us make this a valuable resource for all! These are the Datasets or collections that relate to specific preservation Issues which in turn (may) have Solutions developed for them. The Datasets are categorised by their media type. Click this link to create a new Dataset, then edit the italicised text . These are the preservation or other business driven Issues that relate to a specific Dataset and may have one or more specific Solutions developed to solve them. The aim of an Issue page is to provide a detailed description of the preservation challenge and the requirements of the Issue Owner that will help to inform development of a Solution that solves the Issue. Click this link to create a new Issue, then edit the italicised text . Issues that do not have linked solutions. Why not suggest or contribute a solution? Issues related to appraising or assessing digital content as the first step in deciding how to proceed with preservation activities. Issues related to Datasets that exhibit bit rot (files damaged by imperfect storage, failed write operations or software/processing errors) and require a Solution to identify, and if possible repair, problematic files. Issues where Dataset content does not match a required profile, or needs to be checked or validated against a particular profile. These profiles are typically determined by an organisation's collection or preservation policy. Page: IS2 Do acquired files conform to an agreed technical profile, are they valid and are they complete? Issues related to the wider context of a particular Dataset. Issues related to the capture, harvesting or extraction of data in order to facilitate effective preservation and access. Page: Web based email "harvesting"
Duplicated files can arise from a number of causes. Identical duplicates are relatively easy to detect. Similar duplicates (eg. one file processed from another, or the same item scanned on a different device) can require much more complicated Solutions. Objects embedded within other objects (such as OLE, OOXML, PDF, ZIP) can pose identification, appraisal or risk assessment challenges. Issues relating to digital objects that have dependencies on other objects or content on the web. Issues relating to ensuring the integrity or fixity of Datasets. Issues that relate to the obsolescence of Datasets, preservation risk or business constraints placed on the way that Datasets are managed. Page: BOPCRIS issue - ABBYY "Unknown error"
Issues that relate to the general planning and management of digital preservation. Issues relating to Datasets containing quality issues caused by digitisation, processing or format migration. Issues relating to the retention, disposal and/or deletion of digital objects. Issues related to rights or permissions that cause difficulties in managing or preserving Datasets. Digital entities can be made up of a number of objects (eg. masters, services copies, metadata). Structural relationships are important to understand which objects are part of an entity and what they for. Issues related to the obsolescence of software or other systems that manage Datasets. Issues related to Datasets with unknown characteristics that are necessary for a preservation, management or other business need. Datasets containing unknown file formats tend to pose a preservation risk and make management of them difficult. Issues relating to the cost of Dataset management or the Value of the Dataset to its owners and users. Issues that haven't been tagged with any of the labels listed in this column. This provides a useful mechanism for catching Issues that have not been tagged with sufficient detail, or identifying the need to add new labels to this page. These are Solutions that address specific Issues encountered in particular Datasets. Solutions are typically quite specific to a particular Issue and Dataset but many will have a wider application. For details of tools utilised in a Solution, either follow links from individual Solution pages or see the Tool Registry. Click this link to create a new Solution, then edit the italicised text . Solutions for assessing or appraising datasets. Solutions for detecting and possibly repairing bit rot Issues in Datasets. Solutions for capturing data from an external source, or imaging data from hand held media. Solutions for detecting and managing duplicated digital objects or datasets. Solutions for managing and preserving embedded digital objects. Solutions utilising emulation or virtualisation technologies. Solutions for identifying file formats. Solutions for addressing integrity issues using approaches for generating and verifying fixity information such as manifests and checksums. Solutions for migrating data from one format to another. Solutions for assessing or identifying quality Issues in Datasets. Solutions for managing permissions and rights Issues. Solutions for preserving or checking the structural relationships between digital objects belonging to a particular entity. Solutions for validating the conformance of digital objects to file format specifications or institutional profiles. Solutions that haven't been tagged with any of the labels listed in this column. This provides a useful mechanism for catching Issues that have not been tagged with sufficient detail, or identifying the need to add new labels to this page.